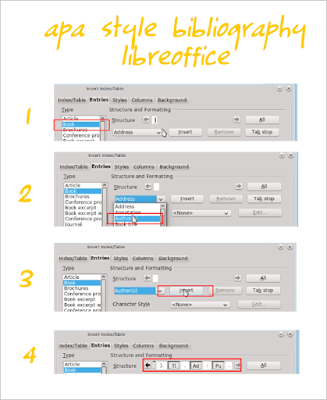 Libreoffice has ability to create APA Style bibliography even any other style. 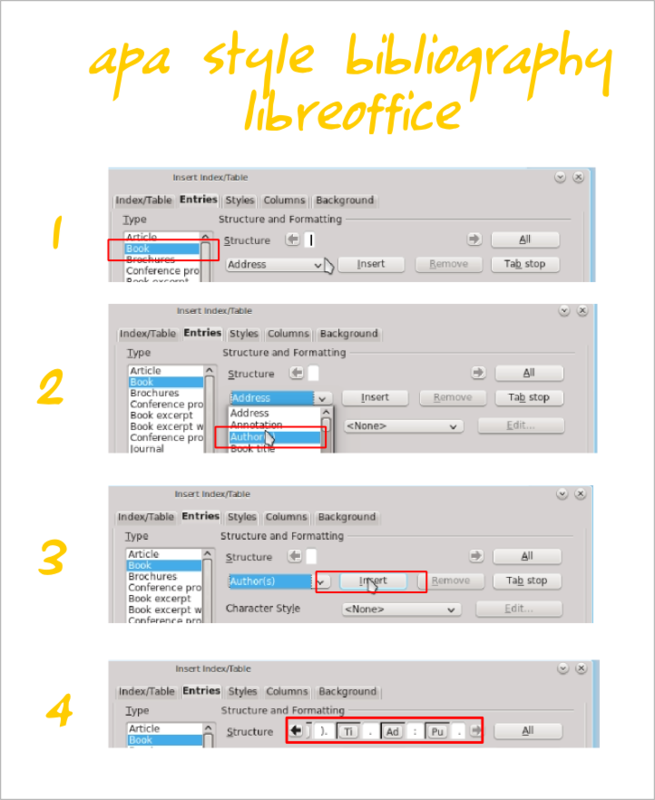 In previous Libreoffice article, we explained about basic bibliography creation. Now, we introduce how to make APA style with Libreoffice. Don't worry, it is automatic. The only requirement is you should know APA Style format. We take only the book format for example here. Au. (Ye). Ti. Ad: Pu. You should pay attention to every character because they all will be used. Firstly, you should enter all your references (books, journals, etc.) into the Libreoffice Bibliography Database. How to do it is explained in our previous article. Now, you should translate the APA Format above into Libreoffice template for bibliography. To do it, do methods below. Open menu Insert > Indexes and Tables > Indexes and Tables. 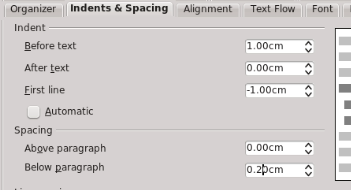 In the dialog appears, select Bibliography from Type options. Select Book from the Types column on the left. 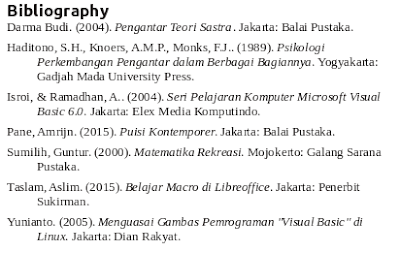 Yes, we only create bibliography for books (excluding journals, webs, and others). On the Structure row, remove all buttons (Sh Au Ti Ye) by selecting and then click remove. Remove them all. On the same Structure row, place your cursor in the blank space. Now, insert your APA Style Format above here. The format is: Au. (Ye). Ti. Ad: Pu. respectively. Enter one by one from selections available under Address button. Click on Ti button you have created. On the Character Style options, select User Entry, then click Edit. Give it Italic. Yes, the book title will be italicized in every of your bibliography. On the Sort By, select Content. On the Sort Keys, select number 1, select Author(s). Yes, all bibliography will be sorted alphabetically by author's name. See picture below. Press OK. Your preparations for APA template are done. You must see an empty grey Bibliography entry appears in your article text in your latest cursor position. It is okay. Note: I know these are seems complicated. If you are confused, you may refer to video I refer below. 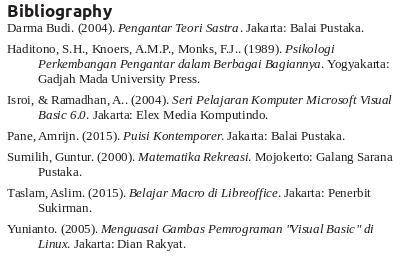 Now, you should cite your book references inside your article text. For example, (Bob, 2015) in paragraph one and (Jim, 2009) in paragraph two. You can do it by menu Insert > Indexes and Tables > Bibliography Entry. You can follow our previous article about it. Now, you can create the final bibliography list on the last page of your work. To do it, just right-click on the grey empty Bibliography entry in your text > Update. To create hanging indentation like in real bibliography works, you must edit Bibliography paragraph style first. To do that, right-click on the bibliography list > Edit Paragraph Style > open Indent and Spacing tab > fill Before Text = 1.00cm First Line = -1 Below Paragraph = 0.2cm. See picture below. Your APA Style bibliography is done.